Generics and Biosimilars Initiative Journal (GaBI Journal). 2018;7(4):152-7. As the number of biosimilar product approvals continues to grow, it will become even more important to collect pharmacovigilance data that are accurate and attributable to the specific product. Different countries and regions have taken various approaches to ensuring accurate product traceability. Meanwhile, how biosimilars are named has become complex and inconsistent globally. The US Food and Drug Administration’s (FDA) recently published final guidance states that a distinct, four-letter suffix should be added to the non-proprietary name. This approach has its critics who contain that it causes confusion for prescribers and will create an artificial barrier inhibiting prescribing. Through a literature review, the authors explore the impact that introducing such a suffix has on safety reporting, product-specific tracking, prescriber comfort with biosimilars, and biosimilar uptake. The findings from outside of the US suggest that differential naming facilitates pharmacovigilance and better product traceability and helps to minimize inadvertent substitution. Also, based on the evidence presented, it would seem that a system using International Nonproprietary Names (INNs) is essential for increasing physician comfort with the use of biosimilars. Furthermore, early data belie the notion that the US differential naming approach hinders the possibility of a favourably biosimilar marketplace and the ability for a biosimilar sponsor to compete successfully. The availability of biological drugs is an important advancement in treating complex diseases. However, the inherent complexities in developing and manufacturing biologicals have inevitably meant that their use is costly, which in turn places a high burden on the healthcare system. In the US, the per cent of pharmaceutical spending attributable to biologicals has increased from 13% in 2006 to 27% in 2016 . In 2007, the average daily cost of a biological was 22 times that of a small molecule drug . Biosimilars present the possibility of lowering these costs while offering additional treatment options for patients. The pace of biosimilar approvals in the US has been accelerating, with the US Food and Drug Administration (FDA) approving five products in 2017, two of which were for the blockbuster originator biologicals Humira® and Remicade® . Currently, there are 12 biosimilar products approved in the US and 22 distinct biosimilar products approved in the EU, see note. In fact, in the first eight and a half years after the regulatory pathway was established, FDA approved more biosimilars to more reference products (12 unique biosimilars to eight reference products) than the EU (five unique biosimilars to two reference products). As the number of biosimilar approvals continues to grow, it will become even more important to collect pharmacovigilance data that are accurate and attributable to the specific product. The World Health Organization (WHO) proposed an approach of assigning all biological products a 4-6 character alfa-numeric biological qualifier (BQ) code. The BQ would consist of four random consonants and an optional 2-digit checksum (calculated from the letters and their order in the BQ code). In October 2017, WHO announced that it would not proceed with BQ code system. Different countries and regions have taken various approaches to ensuring accurate product traceability; the EU passed legislation requiring the recording of brand name, batch number and lot number, while the US and Japan pursued the use of distinguishable non-proprietary names. The latter has been criticized by some who believe it may negatively impact the uptake of biosimilars. How biosimilars are named has become complex and inconsistent globally. FDA’s final guidance on the naming of biologicals (reference products and their biosimilars), with the addition of a distinct four-letter suffix to the non-proprietary name, was a major step forward in supporting more accurate pharmacovigilance. Those in favour of the suffix contend that the distinct nomenclature allows for better product-specific tracking of safety and real-world effectiveness. This in turn promotes prescriber and patient comfort with biosimilars, thus serving an important role in the overall adoption of biosimilars and enhancing a robust marketplace. Those who argue against differential naming of biosimilars, including the US Federal Trade Commission (FTC), state that it causes confusion for prescribers, as distinguishable non-proprietary names will make physicians believe there is a difference between the originator and the biosimilar. This, they suggest, would create an artificial barrier by discouraging prescribing, with the consequence of slowing uptake and potentially of inhibiting cost savings. The recent FDA guidance on biosimilar naming and an FTC statement in a recent Department of Health and Human Services (HHS) document, American Patients First: The Trump Administration blueprint to lower drug prices and reduce out-of-pocket cost, prompted a review of published evidence to examine the impact of a distinct four-letter suffix as part of a biological product and a global naming standard for biosimilars [4, 5]. An ad-hoc literature review was conducted between January and October 2018 to gather evidence related to the various stakeholders impacted by introducing a distinct suffix as part of biological product non-proprietary names. These stakeholders included regulatory agencies, physicians, payers, patients, government/affiliated agencies and advocacy groups. PubMed was searched for evidence related to differential nomenclature published in the last five years (2013–2018). Additional sources of evidence included ClinicalTrials.gov, pharmacovigilance databases, naming guidelines and surveys. Literature was reviewed to identify the link between differential nomenclature and better safety reporting, real-world effectiveness and prescriber comfort with biosimilars. In Europe, guidelines on good pharmacovigilance practices (GVP) have been developed for biological medicinal products and require that prescriptions for originator biologicals and biosimilars specify brand names . This helps to reduce ambiguous adverse event (AE) reporting, i.e. an inability to link an AE to a specific product [originator or biosimilar]. A review of the European Eudravigilance database found that during the period March 2017 to February 2018, around 25% of the AEs reported for infliximab were ambiguous even after implementing GVP, with no link to originator or biosimilar, see Figure 1. While these guidelines are beneficial, adopting the current FDA system of a distinct four-letter suffix for biologicals can further reduce ambiguity. However, the distinction between infliximab biosimilar products using differential scientific nomenclature has been sufficient to facilitate post-marketing studies, particularly in inflammatory bowel disease (IBD) indications, as limited data were available at the time of regulatory approval. The Clinicaltrials.gov site was reviewed to establish the number of ongoing, global real-world and observational studies conducted post-marketing for infliximab biosimilars, see Figure 2. The Clinicaltrials.gov database was selected as it includes research studies conducted in 205 countries. In addition, evidence from two published sources, Diena et al. (2017) and Ben-Horin et al. (2016), which reviewed Inflectra® and Remsima® post-marketing studies, see Figure 2 [7, 8], was incorporated. 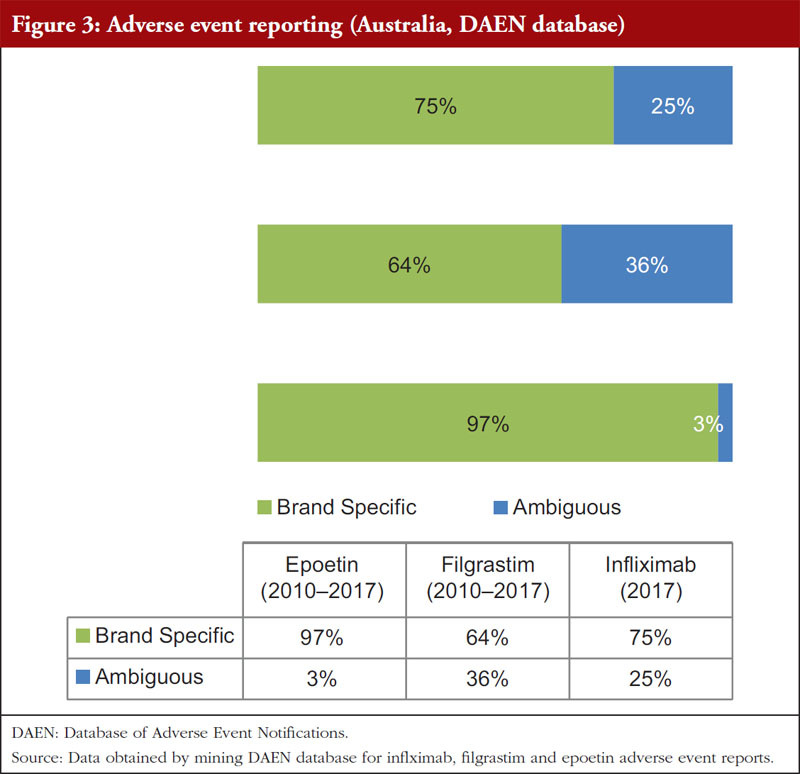 Furthermore, a review of the Australian Therapeutic Goods Administration (TGA) Database of Adverse Event Notifications (DAEN) was conducted to determine if there was a difference in AE reporting between the biosimilars infliximab, filgrastim and epoetin. In Australia, infliximab and filgrastim biosimilars do not have distinct Australian Biological Names (ABN). However, the TGA has used a distinct ABN for epoetin lambda, a biosimilar of epoetin alpha, due to apparently different glycosylation patterns . The data highlight that infliximab (25%) and filgrastim (36%) were associated with higher rates of ambiguous reporting compared to epoetin (3%), see Figure 3. It is relevant to understand physician perceptions of the safety of biosimilars. FDA can only approve a biosimilar if it is highly similar to, and has no clinically meaningful differences from, the originator biological. 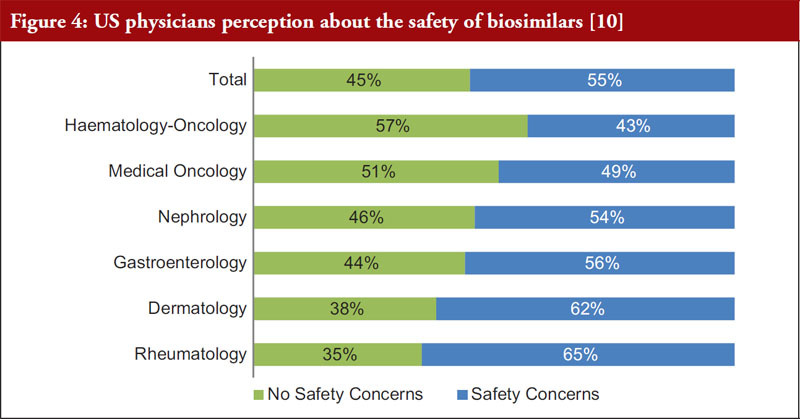 However, in a survey of US physicians across a variety of specialties, over 50% of respondents expressed safety concerns with FDA-approved biosimilars, see Figure 4 . The Biosimilars Forum conducted a survey from November 2015 to January 2016 of US physicians who frequently prescribe biologicals (Reported in Cohen et al. ). The aim of the study was to investigate physician awareness, knowledge and perception of biosimilars. 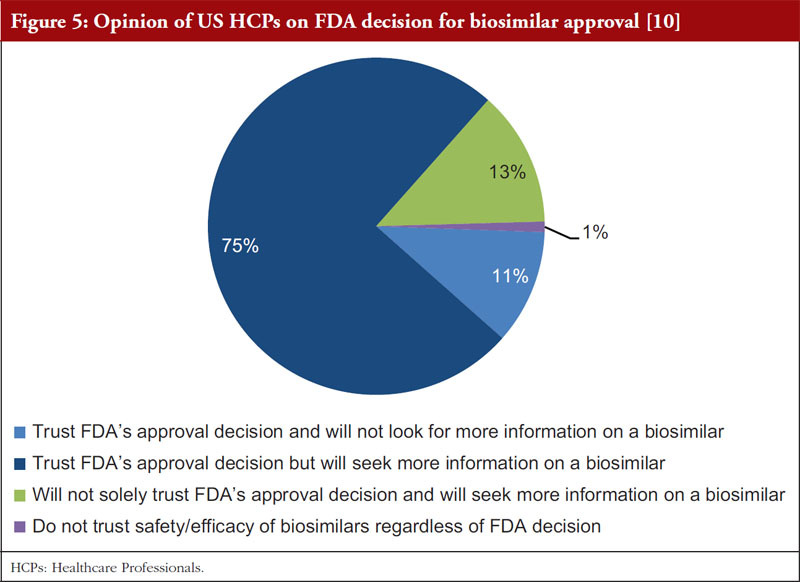 Figure 5 indicates that the vast majority of respondents (75%) considers it necessary to seek additional information on biosimilars prior to prescribing them. In 2015, the Alliance for Safe Biologic Medicines (ASBM) conducted a survey of US Healthcare Professionals (HCPs) to establish their perspective on biosimilar naming. In this survey, 66% of respondents supported distinct non-proprietary naming for originator biologicals and biosimilars, see Figure 6 . Similarly, a 2017 ASBM survey of Canadian healthcare providers found that 68% of respondents wanted distinct non-proprietary naming for all biologicals . There are cases in which the biosimilar is approved in an indication based on the extrapolation of other clinical data. A 2016 survey of US physicians (Cohen et al. ) 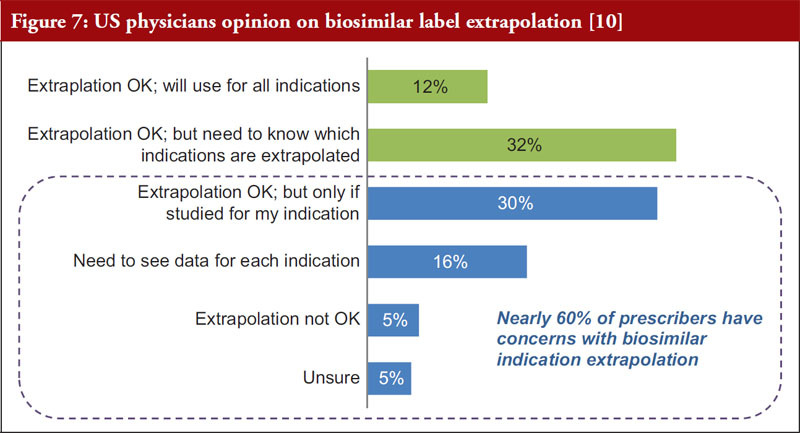 established that roughly 60%, see Figure 7, of respondents expressed concerns with using biosimilars in indications where approval was extrapolated from other clinical data . By promoting effective pharmacovigilance, differential nomenclature may help to alleviate physician concerns with the concept of extrapolation. Due to the inherent complexities associated with developing and manufacturing biosimilar products, differentiating them is essential to both product uptake and product-specific tracking. As highlighted in the introduction, those who argue against distinct biological naming maintain that it does not support biosimilar competition and creates an environment unconducive to a biosimilar manufacturer’s commercial success. However, based on the evidence presented, distinct nomenclature would seem to be essential for accurate pharmacovigilance and to increasing physician comfort with the use of biosimilars, thereby promoting biosimilar uptake and creating a viable competitive market. Having identified the need for a global naming standard, different countries have taken varying approaches to implementation. 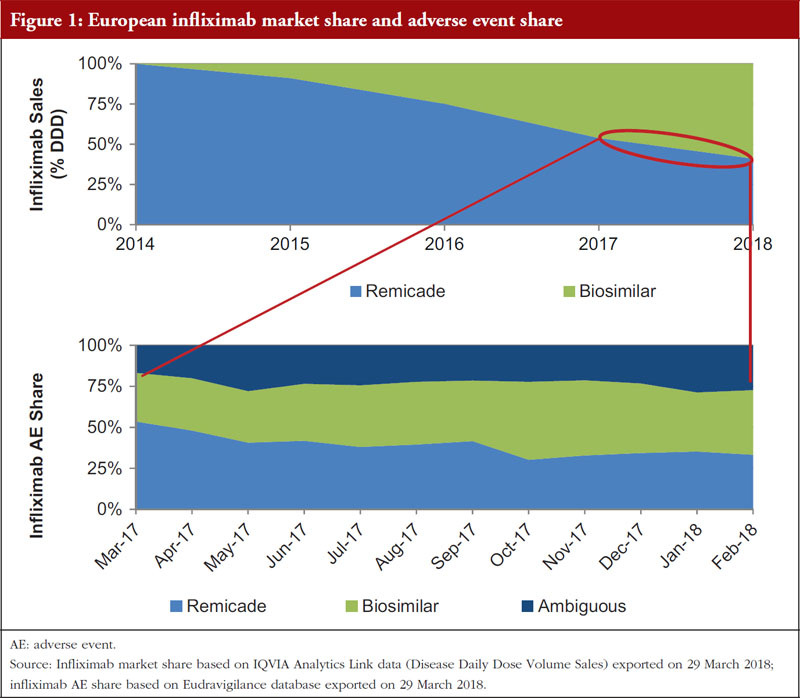 Some may argue that the system used by FDA may hinder biosimilar uptake, however, market data have proven otherwise. While it is not currently possible to make any causal inferences in this paper, anecdotal evidence suggests that distinct non-proprietary names have not deterred uptake. One example of note is the launch of the biosimilar Zarxio®. Zarxio®, a biosimilar of filgrastim, was approved in Europe in 2009 and in the US in 2015. The FDA-designated suffix in the US is filgrastim-sndz, whereas in the EU, all biosimilars are identified by a new brand name with no suffix to the scientific name. A comparison of market share in the first two full calendar years after approval reveals that Zarxio® had slightly better uptake in the US versus in Europe, see Figure 8. This suggests that the US differential naming approach of including a suffix does not hinder the possibility of a favourable biosimilar marketplace and the ability for a biosimilar sponsor to compete successfully. As demonstrated in Figure 8, Zarxio® uptake more than doubled in the second full calendar year post-launch. The recent US HHS blueprint (To Lower Drug Prices and Reduce Out-of-Pocked Costs) stated that physician and patient confidence in biosimilars is critical to increased acceptance of biosimilars . The evidence suggests that additional information and data about biosimilars could help physicians become more comfortable with using them. In an ASBM (Alliance for Safe Biologic Medicines) survey of Canadian physicians, only 54% of respondents stated that should two biological medicines have the same INN, the implication is that they are identical . In a survey of US physicians, 76% of respondents indicated that they had the greatest interest in learning more about the totality of evidence related to safety, efficacy and potency of biosimilars . FDA’s current naming policy (a distinct four-letter suffix as part of a biological product) facilitates better pharmacovigilance and product traceability, which can promote physician comfort with prescribing biosimilars. Assigning distinct non-proprietary names for biosimilars also supports the development of real-world pharmacovigilance data for biosimilars and allows for that information to be disseminated to physicians who often request data to make an informed decision on product therapy choice. Increased comfort in prescribing biosimilars can contribute to a more robust and competitive marketplace if it impacts adoption positively. A lack of unique names across biological products complicates the reporting and tracking of AEs; allowing for better pharmacovigilance and safety tracking would help to alleviate some of these concerns. Unique non-proprietary names of biosimilars can facilitate access to information on individual products, which will lead to better physician understanding of biosimilars and ultimately comfort in prescribing them. Biosimilar label extrapolation is an area of concern for some physicians. The data suggest that differential nomenclature may promote product-specific tracking in post-marketing studies for extrapolated indications, as described in Figure 2. Prescribers may be more comfortable with label extrapolation if they have confidence in the traceability of different biosimilar products and their specific studies. The evidence suggests that differential nomenclature will facilitate traceability, helping to demonstrate the real-world safety and efficacy of biosimilar products. This supports the development of high quality products and continuous investment in manufacturing, as manufacturers can be held accountable for the products distributed. Establishing a reputation for high quality manufacturing eases entry into the biosimilar market, encourages adoption, and promotes marketplace competition. Developing high quality, traceable biosimilar products will contribute to formulary inclusion, enabling payers to better leverage competitive market forces to control the cost of care. In summary, it is believed that findings outside of the US support the notion that a differential naming policy facilitates pharmacovigilance and better product traceability and will also help to minimize inadvertent substitution for drugs distributed via retail pharmacies. This supports manufacturer accountability and the development of high quality products in addition to more attributable measurement of efficacy and safety outcomes for biosimilars. The number of available biosimilars will continue to grow, therefore, it is essential to have a system that allows these products to be differentiated and traced. The evidence collected in this review demonstrates that a distinct four-letter suffix as part of a biological product may reduce the ambiguity in AE reporting, facilitate post-marketing studies in indications with limited data at the time of regulatory approval and alleviate physician concerns related to biosimilar safety and extrapolation. Distinguishable suffixes for biologicals will allow better product tracking and awareness around product effectiveness/outcomes, which ultimately will strengthen physician and patient comfort with biosimilars. Thus, it will enable a competitive and sustainable biosimilar marketplace while promoting biosimilar uptake. Competing interests: Michael Sarshad, Rosanne Campbell and Peter J Pitts have received funding for this research from Amgen. Jacqueline Vanderpuye-Orgle was employed by Amgen and held Amgen stock during this research. She is currently employed by Parexel. Note: Distinct biosimilar products approved in EU include: (1) products in the EU that are considered ‘transition’ products in the US, i.e. biological products approved pursuant to new drug applications (NDAs), including section 505(b)(2) NDAs, e.g. growth hormones, insulins; and (2) products licensed in the EU under multiple brand authorizations. 1. Morton FS, Boller LT. Enabling competition in pharmaceutical markets. Hutchins Center Working Paper #30. May 2017. 2. Statement of Ed Weisbart, MD, Chief Medical Officer, Express Scripts in Hearing Before the Subcommittee on Health of the Committee on Energy and Commerce. May 2, 2017. 7. 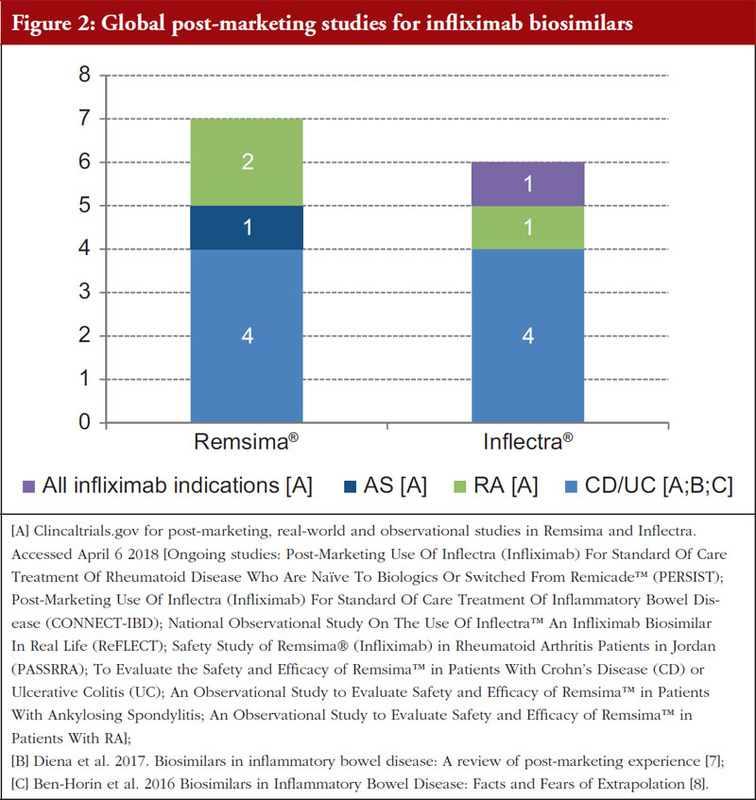 Deiana S, Gabbani T, Annese V. Biosimilars in inflammatory bowel disease: A review of post-marketing experience. World J Gastroenterol. 2017;23(2):197-203. 8. Ben-Horin S, Vande Casteele N, Schreiber S, Lakatos PL. Biosimilars in inflammatory bowel disease: facts and fears of extrapolation. Clin Gastroenterol Hepatol. 2016;14(12):1685-96. 10. Cohen H, Beydoun D, Chien D, Lessor T, McCabe D, Muenzberg M, et al. Awareness, knowledge, and perceptions of biosimilars among specialty physicians. Adv Ther, 2017;33(12):2160-72. 12. Industry Standard Research. ASBM Biosimilars. Canada prescribers and biosimilars. Biosimilars, familarity, knowledge, attitudes and beliefs. 2017. Where are the references and figures for this article? Many thanks for sharing the findings of your research. I would like to know why a new brand name may be considered not good enough to differentiate a biosimilar from a reference product for post-marketing surveillance purpose. Great question. Certain hospital systems and clinical facilities may still utilize software which identify drugs by their scientific names instead of their brand names. This has often been the standard because most clinicians are more familiar with a drug’s scientific name versus its brand name. In those instances, the biosimilar drugs become indistinguishable in the system and thus difficult to trace. Thank you for your valuable interest in the article ‘The need for distinct nomenclature for originator and biosimilar products’, the references are now available to view online. We very much appreciate your kind feedback, and please continue with your valuable comments to GaBI Journal. Thank you for your interest in GaBI. Please enjoy the quality information and content published under GaBI (GaBI Online and GaBI Journal). EUDRAVigilance, as with many pharmacovigilance databases, lists drugs by INN and Brand name. This study identifies that some adverse events have been reported for biologics for which competing brands are available but brand name is not stated (“ambiguous”). This could delay the discovery of emerging unexpected adverse events associated with just one brand. Experience however tells us that although the brand may not be reported as a keyword in the searchable database headings, it is usually reported in the main body of text in the report. Please can the authors say whether the ambiguous brand name reporting was calculated from the headline search criteria – or were they calculated including a full reading of the text of the report (which experience tells us is likely to be a lower percentage)? Very many thanks for the clarification. Thank you for your question. The analysis was actually done by exporting the reports from the database and reviewing them individually for AEs over a 12-month period. This way we would avoid the any ambiguity based on headings alone.